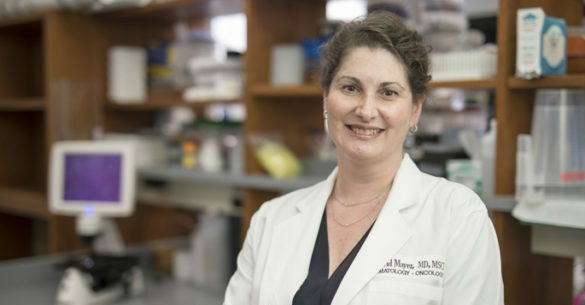 Ingrid Mayer, M.D., MSCI, and colleagues are studying a combination of three immunotherapy compounds for patients with a specific type of advanced breast cancer. Vanderbilt-Ingram Cancer Center (VICC) has received $2.3 million to fund a clinical research trial testing a combination of three immunotherapy compounds for patients with a specific type of advanced breast cancer. Ingrid Mayer, M.D., MSCI, Ingram Associate Professor of Cancer Research, associate professor of Medicine, VICC Breast Cancer Research Program Leader and VICC Breast Cancer SPORE co-principal investigator, will lead the VICC trial. The trial for patients with estrogen receptor-positive (ER+) metastatic breast cancer is one of 10 projects launched by Stand Up To Cancer (SU2C), a nonprofit research foundation dedicated to accelerating the pace of research and bringing therapies to patients more quickly, and the American Association for Cancer Research (AACR), SU2C’s scientific partner. The 10 SU2C Catalyst clinical trial projects will enable researchers from more than 30 institutions to collaborate across academic and corporate borders on a variety of cancers. The inaugural SU2C Catalyst projects will explore new uses for an array of powerful medicines from three SU2C Catalyst charter supporters and six other pharmaceutical companies. Grants to support the trials and access to medicines are being provided by Merck (known as MSD outside the U.S. and Canada), as well as Bristol-Myers Squibb Co. and Genentech, a member of the Roche Group. These supporters offered compounds — both new pharmaceutical compounds that they are developing and approved agents that can be investigated for other uses — to be used by the academic cancer research community, singly or in combination with products from the charter supporters or other companies. The use of these treatments and combinations with compounds from additional companies — in some cases triple combinations — were proposed by the academic research community in response to competitive requests for proposals. The trial led by Mayer is titled Immunotherapy combination strategies in ER-positive metastatic breast cancer and will test combinations of the Genentech therapies atezolizumab (Tecentriq), cobimetinib (Cotellic) and idasanutlin. “We are honored by our selection to lead this important clinical research trial of novel combination therapies for these breast cancer patients with advanced disease,” said Mayer. Mayer anticipates the clinical trial at VICC will become available for patient enrollment in the first quarter of 2018. The 10 inaugural clinical trials will address a wide variety of cancers, including breast, lung, melanoma, multiple myeloma, ovarian, pancreatic, hypermutant pediatric cancers, sarcoma and urothelial cancer. The focus of SU2C Catalyst clinical trials is to study those treatments in combination with other pharmaceutical company medicines, devices and therapies as well as standard-of-care treatments. The trials will attempt to determine if the combination therapies work and, if so, why they work. Additional pharmaceutical companies providing compounds to be studied or offering financial support include AbbVie, Astex Pharmaceuticals, Iovance Biotherapeutics, Mirati Therapeutics, Prometheus Laboratories and TESARO. For details about VICC clinical trials, visit www.vicc.org/ct.